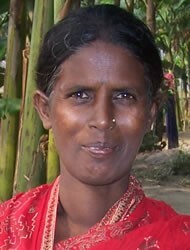 The Mahali of Bangladesh are related to a much larger group called Santal, both groups being of the proto-Australoid race and speaking related languages. The Mahali, however, live in villages which are separate from Santali villages as well as separate from Bengali villages. trade is a family affair as Mahali children learn to weave bamboo into baskets of various shapes and sizes at a fairly young age. Because of their basket trade, most Mahali villages are located along bus routes and are very near to markets where they sell their baskets. 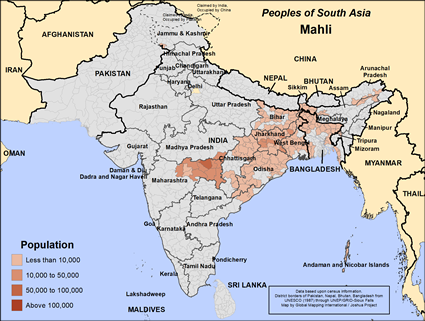 The Mahali of Bangladesh are nearly 100% Christian. Furthermore, they are nearly all Catholic, and there are Catholic mission schools near several Mahali villages. Thus, the younger generation of Mahali tend to have a basic education, though attendance at school is an issue. Few go on for higher education. One of their needs, then, could be for education beyond primary school. They could also benefit from job skills training as Bengalis are increasingly getting involved in the bamboo weaving business and therefore making it more difficult for Mahalis to make a living weaving baskets. Another need is training for church lay leaders. While the Mahali are primarily Christian, literacy is not widespread and many are unable to read the Bible and are therefore dependent on Christian lay leaders for gaining an understanding of the Bible. View Mahli in all countries.